Dixie served 6 years as a K-9 officer for Morrow County. 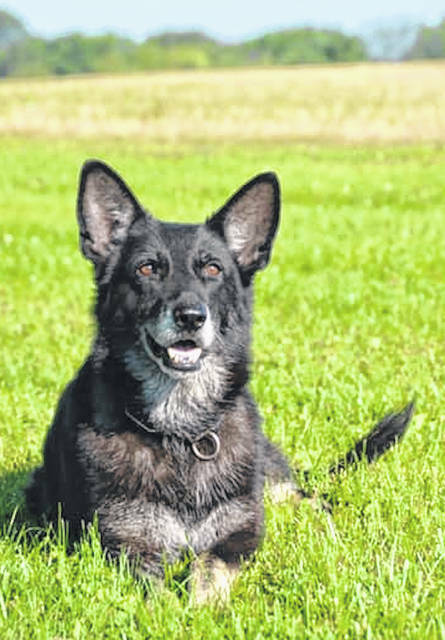 MOUNT GILEAD — A former Morrow County canine officer has died. “It is with deep sadness that we inform you of the loss of retired K-9 Dixie,” Sheriff John Hinton posted on Facebook Tuesday morning. Dixie was a multi purpose German shepherd who was a member of the Morrow County Sheriff’s Office for 6 years with her handler, Lt. Brian Newsome. Dixie was certified in narcotic detection, apprehension and tracking. She had multiple calls for service each year she was with the Sheriff’s Office. “Dixie retired in 2016 and lived with Lt. Newsome and his family. A special thank you to Dr. Prothman for his assistance and care of Dixie,” Hinton said. The Morrow County Sheriff’s Office held a retirement party, including punch and cookies, for her in November 2017. At that party Newsome praised his partner. “We’ve been together on the road eight hours a day, five days a week. I couldn’t ask for a better dog; she’s very loyal,” he said. Within minutes of the social media post, residents replied with an outpouring of affection and sympathy and thanked Dixie for her service.